Whether it's the cool, crisp autumn air, the scent of roasted marshmallows in the backyard, or the walking around at the Texas State Fair, Autumn just makes me smile! This Friday I discovered a cute little nursery in the small town where I work. I was instantly drawn to the sea of orange pumpkins they had on display all over the front of their lot. I went by on my lunch break to pick up a few. To my surprise they had the "fancy" kind. And they weren't expensive either. They loaded up my little pick up truck and I even had enough $ to buy a corn stalk. 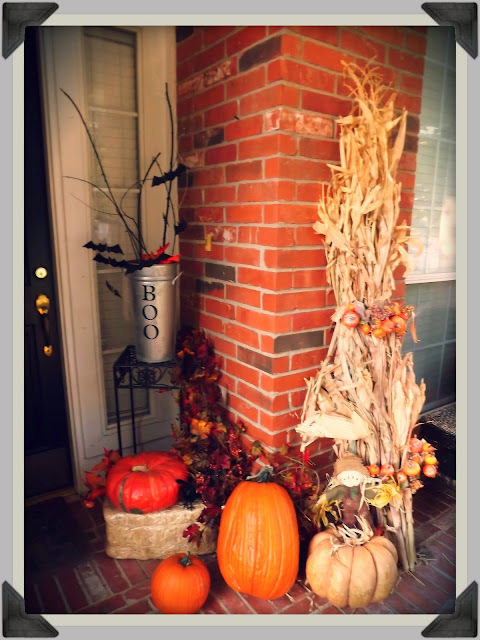 When I got home I immediately started to arrange the pumpkins on my front porch. 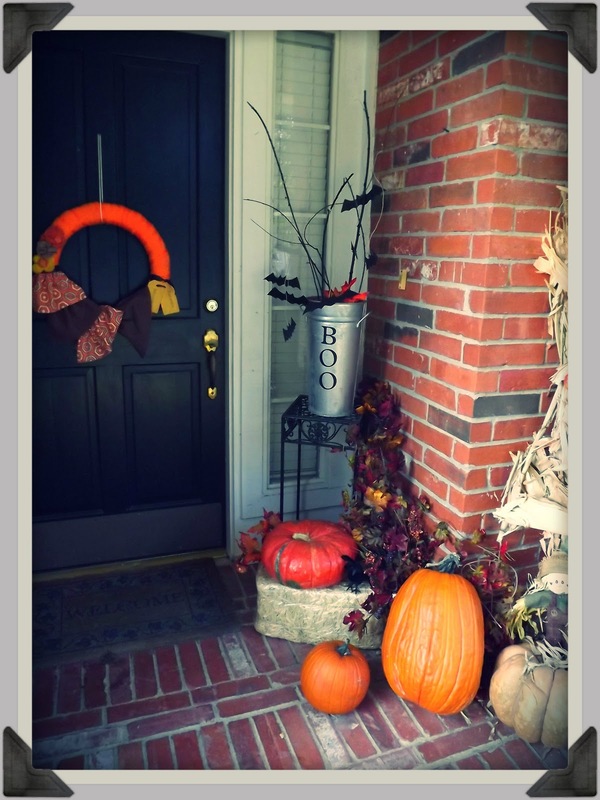 I decided to add a little bit of Halloween touches here and there and not over do it like in years past. This way I can leave my display up all thru November for Thanksgiving. 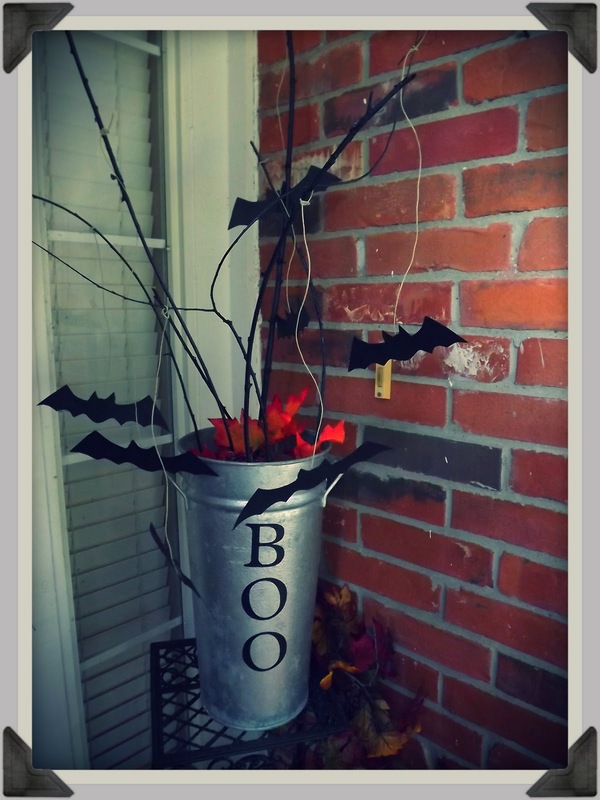 I added my favorite tin bucket from last year, spray painted some branches black, added the BOO vinyl letters cut with my Cricut and hung some cardstock bats. Super easy! 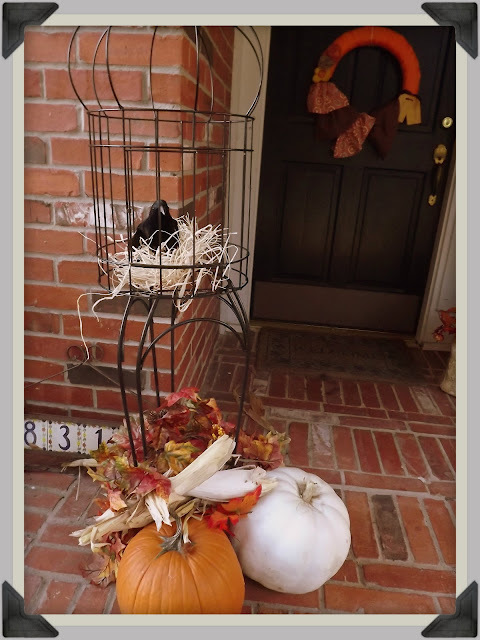 I also took my birdcage, painted that black and filled with some raffia I had on hand. I then added a Dollar Tree crow for a bit of whimsy. ﻿Here's a better look at the corn stalk. I tied some decorative faux pumpkin candle rings that I simply opened up to add a bit of interest to it. Don't you just love all the different variations of color the pumpkins add? You can also hang little ghosts from them if you like. Have fun. And don't forget to enter my Scrapbooking Software giveaway! Good buys are always a plus!! Autumn makes me smile too!! Love the crow in the bird cage!